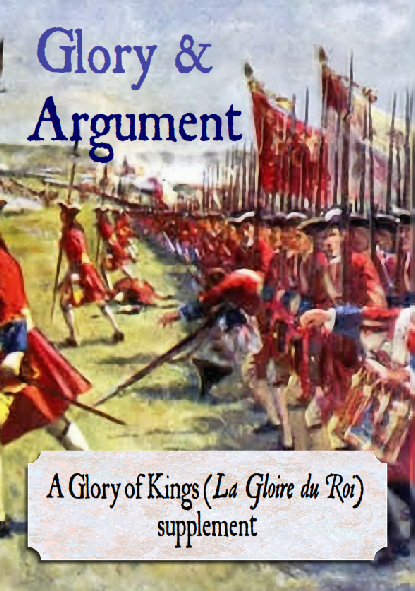 Glory & Argument is a supplement for our play by (e)mail game The Glory of Kings. It will also be of interest to anyone with a keen interest in 18th century history, as the following list of subjects covered in it will demonstrate! Featured - Palace guard companies; War dog sections; Mobile vet clinics; Horse artillery batteries; Light infantry companies; Siege breechloading artillery; Improved bayonets; Steel ramrods; Improved heavy cavalry saddles; Conventional battlefield tactics; Extra powder and shot consignments; Parachute rockets; War dog armour; Wooden gun rests;Light infantry tactics; Soldier’s families; Canteens; Bandoliers; Retrenchments; Engineer battalions; Old and new muskets; Teaching by officers; Understrength units; Large barges; Line ahead formation and spacing; Flotillas; Long barrel naval cannon; Naval signal rockets; Dhows, large and small; Spanish law on succession; Minors and royal succession; Treaty of Westphalia; Treaty of Karlowitz 1699; County of Ravensberg; Duchy of Montferrat; Duchy of Warmia; Hopsdar of Moldavia; Scotland’s Claim of Right Act 1689; Royal Assent in England; Burgage boroughs; Tartars or Tatars; Tonga; Burma; Far Eastern society structure; Matsumae clan; Kingdom of Naples; Meskawki Indians, Quapaw Indians; Coahuiltec Indians; Codified law; Daneil Faherenheit; Tomaso Albinoni; Professor Leibniz; Catherine of Braganza; Colonel Benjamin Church; Jeremiah Clarke; Charles de la Fosse; Jakob le Blon; Johann Pachelbel; Guiseppi Campani; Jose da Silva Pais; Jean Maritz; Nicolaas Hartsoeker; Edward Lloyd; Sir John Houblon; Abraham Houblon; Gottfried Silbermann; Andreas Silbermann; Francis Eyles; Giacomo Pylarini; Philip von Hornigk; Albert Bogard; Craft and workhouse institues; Whaling stations; Creosote; Improved whisky barrels; Refrigeration; Public carriage services; Improved suspension; Dropped axles for carts; Bog iron; Stamp mills; Hydraulic mining; Vintage wines; Brussel sprouts; Retained rotten grain; Jute; Asil horses; Caspian horses; Turkoman horses; Shirazi horses; Baluchi horses; Kurdish horses; Falconry; Human anatomy; Scurvy; Population growth; Missionaries; Lutheran doctrine on divorce and remarriage; Archbishop of Canterbury; Catholics in England; Hajj; Koranic law and wives; Zakat; the Chaldean Catholic Church; churches in Poland; religious status of Western European states; the Holy Lance; Lenape Indians; Ojibwa Indians; Apalchee Indians; mounting an expedition; forging documents; magic lanterns; bulldogs; universities; Chinese spouting bowls; Chinese magic mirrors; the Marine Society; cymbals; copper box communication; copper wire; ice houses; fasting; music pavilions.